Hereditary angioedema (HAE) is an inherited condition characterized by recurrent episodes of nonpruritic, nonpitting, subcutaneous or submucosal swelling without the presence of urticarial lesions. Multiple areas of the body can be involved including hands, feet, intestinal wall, genitalia, face, tongue, or larynx.1 Swelling of the pharynx or larynx can be life–threatening due to asphyxia. There are 2 main types of HAE that are inherited in an autosomal dominant manner. Type I HAE accounts for approximately 85% of cases and results from a quantitative deficiency of C1 inhibitor. Type II HAE is responsible for approximately 15% of cases and results from a dysfunctional C1 inhibitor protein. The principal mediator involved in HAE during episodes of swelling is bradykinin, a byproduct of the plasma contact system. The C1 inhibitor plays a significant role in the complement cascade, coagulation, and contact systems. 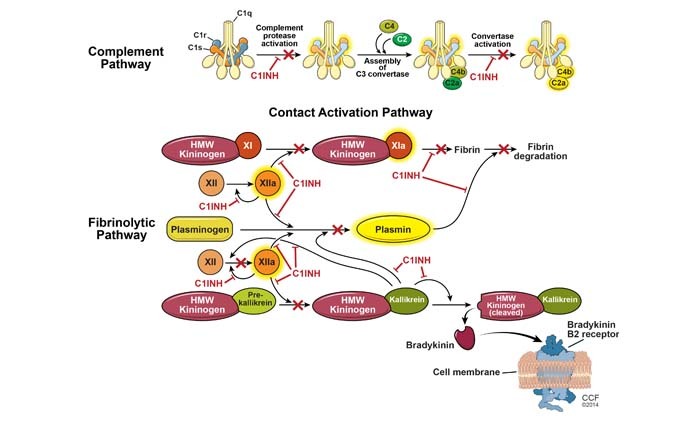 As its name implies, it has an important inhibiting effect on the major proteases in these pathways, including activated Hageman factor, kallikrein, and plasmin, as illustrated in (Figure 1). The C1 inhibitor is ultimately responsible for regulating the production of bradykinin. In this manner, episodes of trauma or stress can activate contact and complement pathways. In the setting of C1–inhibitor deficiency (type I HAE) or C1–inhibitor dysfunction (type II HAE),5 increased levels of bradykinin lead to recurrent episodes of angioedema. HAE with normal C1 inhibitor has been associated with defects in the coagulation cascade, although its underlying pathophysiology remains to be determined. The typical signs and symptoms of HAE start during childhood or puberty and persist throughout life. Usual attacks start with a prodromal sensation of tingling that can be accompanied by a nonpruritic wavy rash. This is followed by slowly progressive swelling that gradually subsides over 48 to 72 hours. The type of swelling seen in HAE is not associated with the presence of urticaria and it is not responsive to the use of steroids and/or antihistamines. Oropharyngeal swelling is of great concern as it can lead to asphyxia and death if it not recognized or treated appropriately. These type of attacks are less frequent, but more than half of HAE patients have at least 1 oropharyngeal attack during their life.6 Abdominal attacks carry significant morbidity and often require emergency visits, hospitalizations, and unnecessary procedures. Acquired angioedema syndromes associated with underlying malignant or rheumatologic disease. Unlike HAE, the main mediator of angioedema in the setting of hypersensitivity reactions or urticaria/angioedema syndromes is histamine, not bradykinin. Bradykinin is responsible for recurrent episodes of swelling seen in HAE and in acquired angioedema and ACE inhibitor–induced angioedema syndromes. Defects in C1 inhibitor lead to unregulated breakdown of the complement cascade including low levels of C4, C1 inhibitor, and/or C1 inhibitor function, seen at baseline and during an acute attack. Rarely, C4 levels remain normal at baseline but decrease in the setting of an acute attack. Acquired angioedema syndromes related to underlying proliferative disorders are often associated with low levels of C1q, as shown in (Table 1). In HAE with normal C1 inhibitor, levels are normal at baseline and during attacks. Gene mutation analysis of factor XII (Hageman factor) may establish the diagnosis; however, an unremarkable result does not exclude HAE with normal C1 inhibitor. There are no laboratory tests that can confirm HAE with normal C1 inhibitor or ACE inhibitor–induced angioedema (Figure 2). Patients who are currently using anabolic androgens should have liver enzymes, urinalysis and lipid profile checked every 6 months and liver ultrasound evaluations every 6 to 12 months, depending on the dose. Dosing relies on finding the lowest dose required to reduce the frequency and severity of swelling episodes rather than targeting to a particular C4 or C1 inhibitor level. Danazol at 200 mg daily or every other day, or stanozolol at 2 mg daily or every other day, are considered effective doses for most patients. Antifibrinolytic agents, such as aminocaproic acid, are another option for long–term treatment. Usual doses consist of 1 to 2 grams 3 times a day, although these drugs are not FDA approved for HAE treatment. Tranexamic acid has been used, but it also is not FDA approved for HAE treatment. Antifibrinolytic agents are reserved for patients who cannot tolerate anabolic steroids or other forms of prophylactic therapy.12,13 Side effects associated with these agents include myalgias, fatigue, and coagulation disorders. This product is indicated for prophylactic use in adolescents and adults with HAE at a dose of 1000 units (10 mL) IV every 3 to 4 days. It is classified as category C for the treatment of HAE during pregnancy. It is also approved for self–administration at home. Hypersensitivity reactions and thrombotic events have been reported. The FDA has not approved the use of human purified and nanofiltered C1 inhibitor concentrate for treatment of acute attacks although it has been shown to reduce the median time to onset of relief compared with placebo. In 2014, the cost of C1 inhibitor concentrate (Cinryze) was $4,906 per single dose in the U.S. According to the product prescribing information, the most common adverse reactions observed by at least 5% of subjects are upper respiratory tract infection, sinusitis, rash, and headache. 200 mg of Danazol 3 times a day or 2 mg stanozolol 3 times a day for 7 to 10 days prior to the procedure. Fresh frozen plasma (FFP) contains C1 inhibitor and can be helpful to reduce severity of attacks. However, the use of FFP is considered controversial as it also contains proteases that can exacerbate symptoms during an acute attack. Berinert is a human, pasteurized, plasma–derived C1 inhibitor product that was first FDA approved in 2009 for the treatment of acute facial, laryngeal, or abdominal attacks in adolescents and adults. It most recently gained FDA approval for pediatric patients in July 2016. This form of C1 inhibitor was found to shorten the median time–to–onset of relief from an acute attack from 1.5 hours to 0.5 hours (P=.0025 vs placebo) in a double–blind, placebo controlled study of 125 patients with HAE.21 Dosing is 20 U/kg IV. Symptom relief is usually seen within 30 to 60 minutes. This form of C1 inhibitor concentrate is not approved for long–term prophylaxis. There are reports of hypersensitivity reactions, laryngeal edema, and thromboembolic events with the use of this agent. However, the most commonly reported adverse effect compared with placebo was dysgeusia. Plasma kallikrein is activated by protease coagulation factor XII. These factors are both inhibited by C1 inhibitor. Active plasma kallikrein induces production of bradykinin. In 2009, ecallantide (Kalbitor), a kallikrein–inhibitor synthesized in yeast, was approved to treatment acute HAE attacks in patients 12 years and older. Double–blind, placebo–controlled trials have shown statistically significant improvements at 4 hours for active treatment compared with placebo22,23 Ecallantide dosing is 30 mg (3 mL) subcutaneously in the setting of an acute attack. There are reports of anaphylaxis related to the development of anti–ecallantide antibodies after repeated exposure. Therefore, ecallantide must be administered in a healthcare setting where personnel, equipment, and supplies for treatment of anaphylaxis are present. Icatibant (Firazyr), a selective bradykinin type 2–receptor antagonist, was FDA–approved in 2011 for the treatment of acute attacks in patients 18 years and older. Dosing is 30 mg (3 mL) administered subcutaneously in a single injection. The first trials found statistically significant decreased time to symptom relief with the use of icatibant compared with tranexamic acid, but not compared with placebo. Subsequently, pooled data demonstrated that icatibant offered symptom relief to a greater percentage of subjects within 4 hours of use as well as provided quicker relief of symptoms compared with placebo and tranexamic acid.23,24 In 2011, a third trial found that icatibant reduced times of symptom severity and shortened the time to initial symptom relief of cutaneous or abdominal attacks (0.8 vs 3.5 hours; P<.001).25 Icatibant was approved for self–administration, although laryngeal attacks can occur. The most common side effects included localized reactions at the administration site. Practice guidelines, including those for children, adolescents and women, have been published.7,27-29 (Table 2) summarizes the therapeutic options for HAE prophylaxis. (Table 3) summarizes treatment of acute attacks. An unacceptably high mortality rate has been observed in patients with untreated or undertreated HAE. A 2012 study identified 214 deaths among 728 patients in families with C1 inhibitor deficiency.31 The same study estimated that approximately one–third of the deaths were from asphyxiation (N = 70) and 63 of those subjects died before HAE was diagnosed. With proper therapy, the morbidity and mortality of hereditary angioedema can be significantly reduced. There may be an increased frequency of HAE attacks in pregnant women, particularly during the second and third trimesters. Such attacks have been treated effectively with the use of C1 inhibitor concentrate.33 More recently, recombinant C1 inhibitor replacement with Rocunest has become an option for pregnant women, as it is classified as category B pregnancy in the United States. Risks, benefits, and burdens merit consideration in determining the most appropriate therapy. Hereditary angioedema is an autosomal dominant disorder associated with substantial morbidity and mortality if untreated or undertreated. Deficiencies in either quantitative or functional levels of C1 inhibitor lead to increased production of bradykinin, the main mediator of recurrent episodes of swelling. New modes of treatment that specifically target affected pathways and lower frequency and severity of attacks have recently received FDA approval. Hereditary angioedema (HAE) is an autosomal dominant inherited condition that affects approximately 1 in 50,000 people. HAE is characterized by recurrent episodes of swelling without the presence of urticarial lesions, mediated by increased levels of bradykinin. Angioedema can affect various parts of the body including the intestinal wall and larynx, which has been associated with increased morbidity and mortality, respectively. Deficiency in C1 inhibitor level and/or function account for type I and type II HAE, respectively. The mechanism for HAE with normal C1 inhibitor is not well understood, but some cases have been associated with a gain of function mutation in factor XII. The goal of HAE therapy is to minimize frequency and severity of angioedema with the use of prophylactic therapy as well as on-demand therapy for acute attacks. In recent years, novel therapies including C1 inhibitor replacement and on-demand selective bradykinin receptor antagonists and kallikrein inhibitors have revolutionized the management of HAE by providing direct targeted therapy. More studies are needed to evaluate treatment options of HAE during pregnancy and in children. Zuraw BL. Hereditary angioedema. N Engl J Med 2008; 359:1027–1036. Nzeako UC, Frigas E, Tremaine WJ. 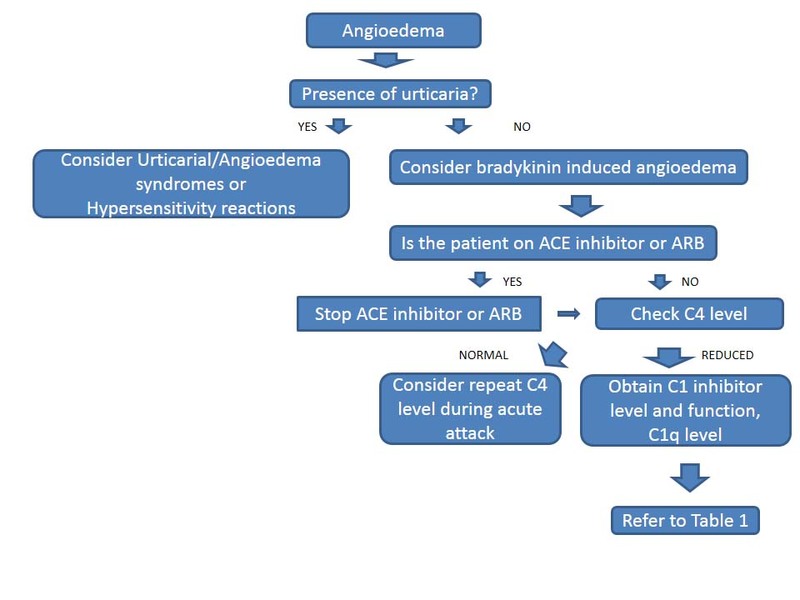 Hereditary angioedema: a broad review for clinicians. Arch Intern Med 2001; 161:2417–2429. Tosi M. Molecular genetics of C1 inhibitor. Immunobiology 1998; 199:358–365. Dewald G, Bork K. Missense mutations in the coagulation factor XII (Hageman factor) gene in hereditary angioedema with normal C1 inhibitor. Biochem Biophys Res Commun 2006; 343:1286–1289. Kaplan AP, Joseph K. The bradykinin-forming cascade and its role in hereditary angioedema. Ann Allergy Asthma Immunol 2010; 104:193–204. Bork K, Meng G, Staubach P, Hardt J. Hereditary angioedema: new findings concerning symptoms, affected organs, and course. Am J Med 2006; 119:267–274. Zuraw BL, Bernstein JA, Lang DM, et al; for the American Academy of Allergy; Asthma and Immunology; American College of Allergy, Asthma and Immunology. A focused parameter update: hereditary angioedema, acquired C1 inhibitor deficiency, and angiotensin–converting enzyme inhibitor-associated angioedema. J Allergy Clin Immunol 2013; 131:1491–1493. Zuraw BL. HAE therapies: past present and future. Allergy Asthma Clin Immunol 2010; 6:23. Spaulding WB. Methyltestosterone therapy for hereditary episodic edema (hereditary angioneurotic edema). Ann Intern Med 1960; 53:739–745. Gelfand JA, Sherins RJ, Alling DW, Frank MM. Treatment of hereditary angioedema with danazol: reversal of clinical and biochemical abnormalities. N Engl J Med 1976; 295:1444–1448. Zuraw BL, Banerji A, Bernstein JA, et al. US Hereditary Angioedema Association Medical Advisory Board 2013 recommendations for the management of hereditary angioedema due to C1 inhibitor deficiency. J Allergy Clin Immunol Pract 2013; 1:458–467. Frank MM, Sergent JS, Kane MA, Alling DW. Epsilon aminocaproic acid therapy of hereditary angioneurotic edema: a double-blind study. N Engl J Med 1972; 286:808–812. Blohmé G. Treatment of hereditary angioneurotic oedema with tranexamic acid: a random double-blind cross-over study. Acta Med Scan 1972; 192:293–298. Gadek JE, Hosea SW, Gelfand JA, et al. Replacement therapy in hereditary angioedema: successful treatment of acute episodes of angioedema with partly purified C1 inhibitor. N Engl J Med 1980; 302:542–546. Agostoni A, Bergamaschini L, Martignoni G, Cicardi M, Marasini B. Treatment of acute attacks of hereditary angioedema C1–inhibitor concentrate. Ann Allergy 1980; 44:299–301. Bork K, Witzke G. Long–term prophylaxis with C1–inhibitor (C1 INH) concentrate in patients with recurrent angioedema caused by hereditary and acquired C1–inhibitor deficiency. J Allergy Clin Immunol 1989; 83:677–682. Burnouf T, Radosevich M. Nanofiltration of plasma–derived biopharmaceutical products. Haemophilia 2003; 9:24–37. Zuraw BL, Busse PJ, White M, et al. Nanofiltered C1 inhibitor concentrate for treatment of hereditary angioedema. N Engl J Med 2010; 363:513–522. Jaffe CJ, Atkinson JP, Gelfand JA, Frank MM. Hereditary angioedema: the use of fresh frozen plasma for prophylaxis in patients undergoing oral surgery. J Allergy Clin Immunol 1975; 55:386–393. Pickering RJ, Good RA, Kelly JR, Gewurz H. Replacement therapy in hereditary angioedema. Successful treatment of two patients with fresh frozen plasma. Lancet 1969; 1:326–330. Craig TJ, Levy RJ, Wasserman RL, et al. Efficacy of human C1 esterase inhibitor concentrate compared with placebo in acute hereditary angioedema attacks. J Allergy Clin Immunol 2009; 124:801–808. Levy RJ, Lumry WR, McNeil DL, et al. EDEMA4: a phase 3, double–blind study of subcutaneous ecallantide treatment for acute attacks of hereditary angioedema. Ann Allergy Asthma Immunol 2010; 104:523–529. Cicardi M, Levy RJ, McNeil DL, et al. Ecallantide for the treatment of acute attacks in hereditary angioedema. N Engl J Med 2010; 363:523–531. Riedl M. Icatibant, a selective bradykinin B2 receptor antagonist, proves effective and safe in treating the symptoms of hereditary angioedema (HAE) attacks. J Allergy Clin Immunol 2008; 121:S103. Lumry WR, Li HH, Levy RJ, et al. Randomized placebo-controlled trial of the bradykinin B2 receptor antagonist icatibant for the treatment of acute attacks of hereditary angioedema: the FAST–3 trial. Ann Allergy Asthma Immunol 2011; 107:529–537. Riedl MA, Bernstein JA, Li H, et al. Recombinant human C1 esterase inhibitor relieves symptoms of hereditary angioedema attacks: phase 3, randomized, placebo–controlled trial. Ann Allergy Asthma Immunol 2014; 112:163–169.e1. Gompels MM, Lock RJ, Abinum M, et al. C1 inhibitor deficiency: concensus document. Clin Exp Immunol 2005; 39:379–394. Erratum in: Clin Exp immunol 2005; 141:189–190. Wahn V, Aberer W, Eberl W, et al. Hereditary angioedema (HAE) in children and adolescents--a consensus on therapeutic strategies. Eur J Pediatr 2012; 171:1339–1348. Caballero T, Farkas H, Bouillet L, et al; C-1-INH Deficiency Working Group. International consensus and practical guidelines on the gynecologic and obstetric management of female patients with hereditary angioedema caused by C1 inhibitor deficiency. J Allergy Clin Immunol 2012; 129:308–320. Cicardi M, Zuraw B. Treatment of acute episodes of hereditary angioedema (HAE) in adults and children. UpToDate. Literature review current through November 2016. Bork K, Hardt J, Witzke G. Fatal laryngeal attacks and mortality in hereditary angioedema due to C1 inhibitor deficiency. J Allergy Clin Immunol 2012; 130:692–697. Frank MM, Zuraw B, Banerji A, et al. Management of children with hereditary angioedema due to C1 inhibitor deficiency. Pediatrics 2016; 138:e20160575. Bouillet L. Hereditary angioedema in women. Allergy Asthma Clin Immunol 2010;6:17. Roxana Siles, MD; nothing to disclose.